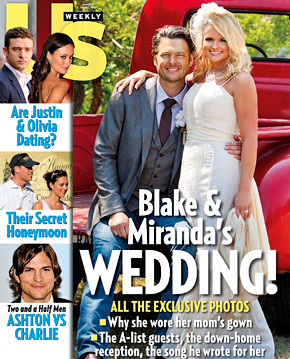 Miranda Lambert and Blake Shelton Wedding Pictures! Can’t wait to see Miranda Lambert’s wedding dress, the cake, or the handsome groom in pictures? Neither can we! The pictures from Miranda Lambert and Blake Shelton‘s Saturday night wedding are still trickling in, with this first shot coming out in this preview from Us Weekly. I absolutely LOVE Miranda’s dress and think she looks WONDERFUL! We promise as the pictures come out we’ll have em for you here… right here… right in this very spot! For now let’s enjoy some blurry paparazzi shots from the British Daily Mail. We just got the dish on the newlyweds bling. Both Blake and Miranda’s rings were custom made by Beverly Hills jeweler Johnathon Arndt who also handcrafted Carrie Underwoods’ engagement ring and wedding band. Miranda’s ring is a 5-carat white diamond eternity ring, and Blake’s ring features a black diamond mounted on the inside (a detail specifically requested by Miranda) and a hand engraving based on one of Shelton’s tattoos. For the reception, Miranda changed into a strapless silk dress from Priscilla of Boston… my guess is this design right here. Country Music News Blog participates in advertising programs that help fund the operation of this site. For more information please visit our privacy statement. This entry was posted in Blake Shelton, News by Shauna "WhiskeyChick" Castorena. Bookmark the permalink.